D.C. area residents, like most Americans, work long and hard hours. We stress ourselves to sustain our standard of living, but it is too easy to forget to live our lives. Take a morning or afternoon off for the sole purpose of allowing yourself to find the beauty within the Beltway. That’s how long I’ve lived in the Washington, D.C. area. 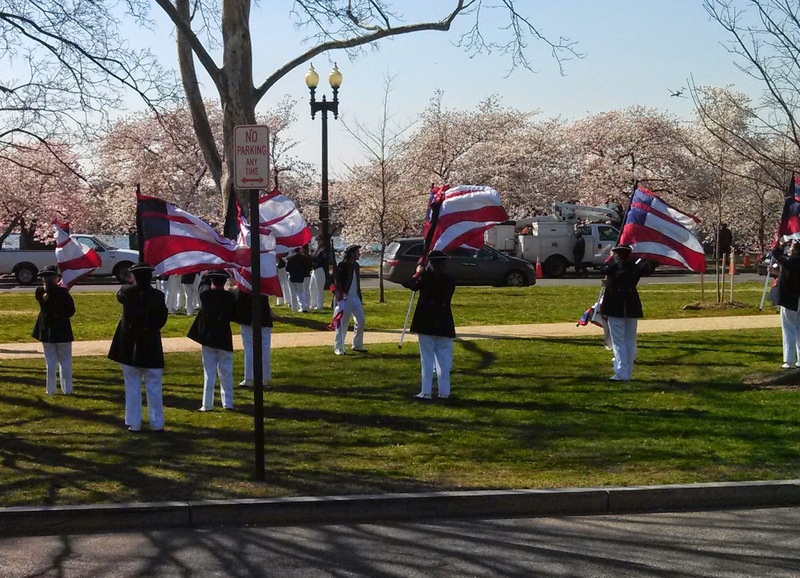 I have been to the National Mall many times and have walked around the Tidal Basin to the Jefferson Memorial a few times, but I had never been to the Tidal Basin during Cherry Blossom season until this year. I generally try to avoid events in D.C. that attract large crowds. I like being able to walk in a straight line without people randomly stopping in front of me or stepping into my path without any care that they are getting in someone else’s way. However, I wanted to see the cherry blossoms and knew that I would have to deal with the crowds one day. 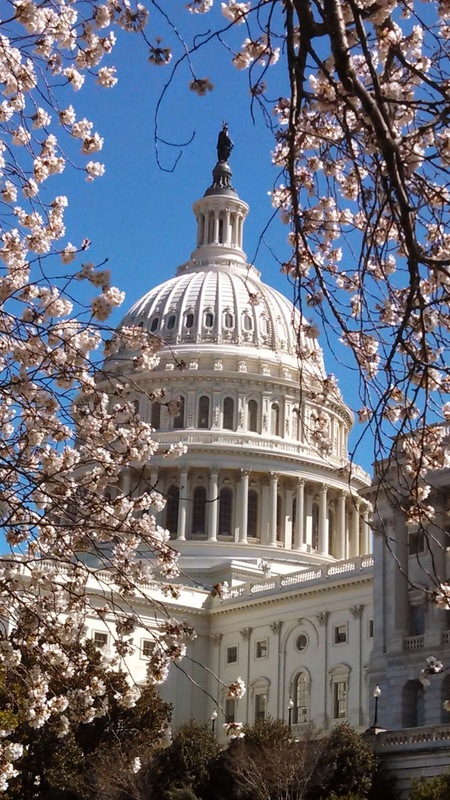 I finally found the inspiration to visit the cherry blossoms when I was on Capitol Hill on a beautiful Sunday morning. After one of the worst D.C. winters in years, the warm sun and cool spring air refreshed my spirits. The many cheerful families taking pictures under the blossoming branches of the cherry trees surrounding the Capitol Building convinced me that crowds gathered to see the cherry blossoms could be enjoyable. 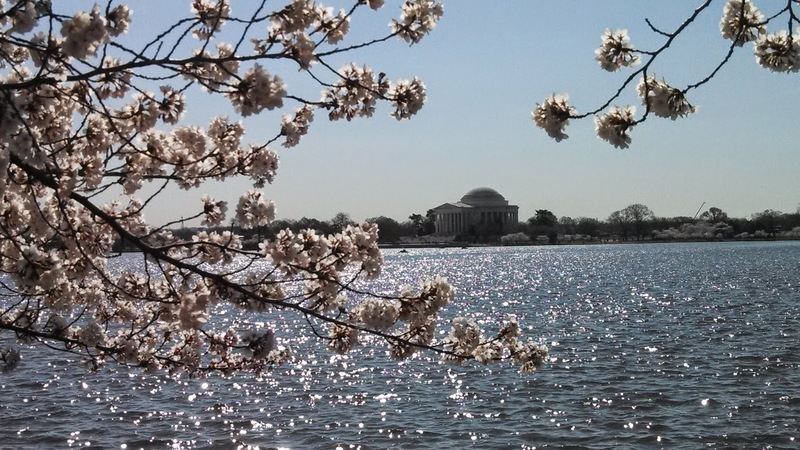 I decided it was finally time for this curmudgeon to check out the cherry blossoms surrounding the Tidal Basin. The following Thursday morning I drove across the 14th Street Bridge into D.C. and found a parking spot in East Potomac Park, which is just south of the Jefferson Memorial and Tidal Basin. 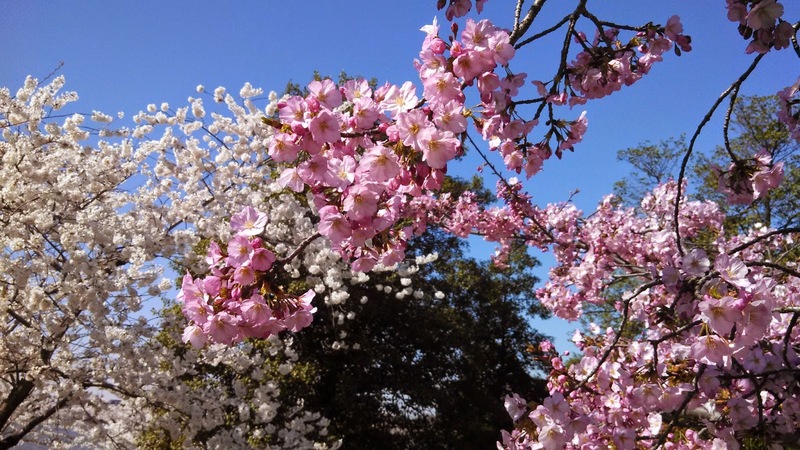 I had two goals: 1) to see the cherry blossoms; and 2) to have a relaxing run in the temperate weather. Equipped with only my phone, I set off. 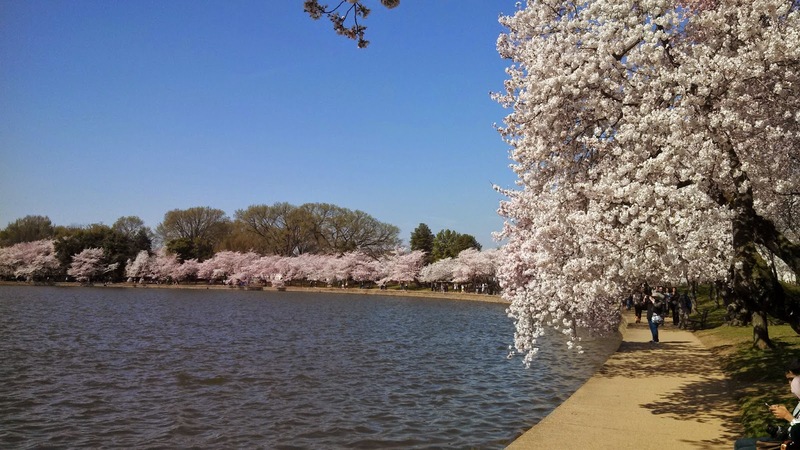 I ran towards the Tidal Basin and saw the sidewalks around the cherry trees were packed with tourists. 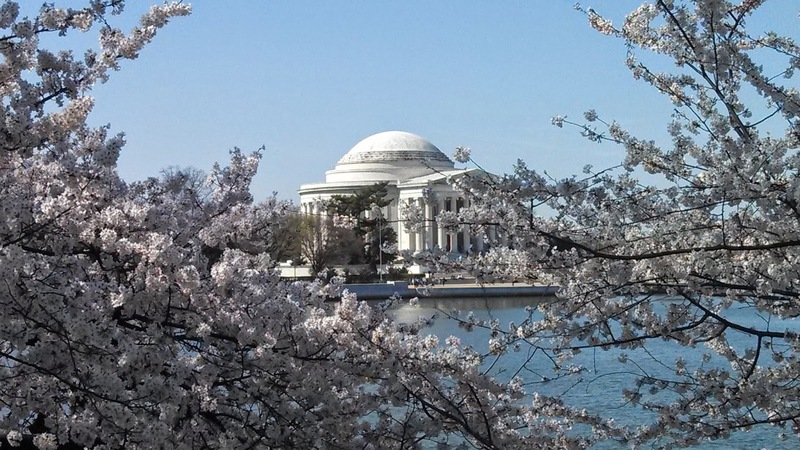 I wanted to have a decent run without having to slow down and stop for the crowds, so I kept my distance from the Tidal Basin and ran around the other side of the Jefferson Memorial. 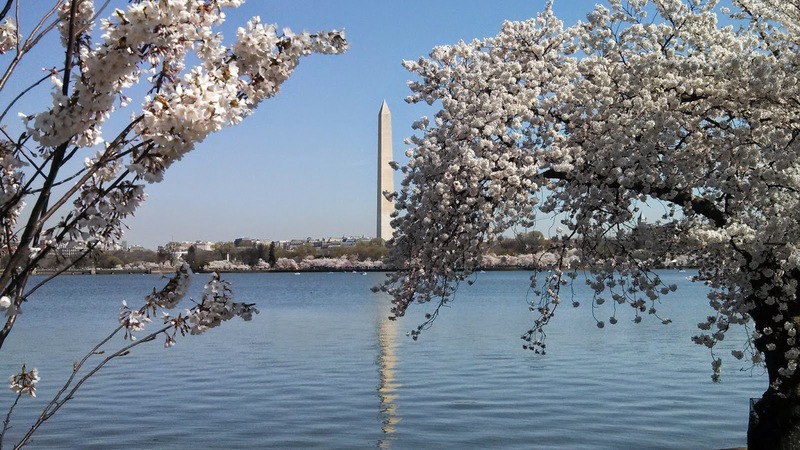 I ran along the surrounding streets and crossed the Kutz Bridge where I marveled at the view of the blossoms encircling the entire Tidal Basin. After crossing the bridge, I veered to the right where there is a visitors center near the World War II memorial. A school band’s drumline was practicing, and my visceral response was to increase my pace to match the beat of their drums. After passing the vistors center, I found myself on the south side of the Reflecting Pool. I turned left and ran about halfway to the Lincoln Memorial before turning around to begin the leisurely part of my run. When I reached the visitors center, band members were twirling flags while the brass section played a few patriotic songs. I stopped and took a few pictures with my phone before continuing my run. 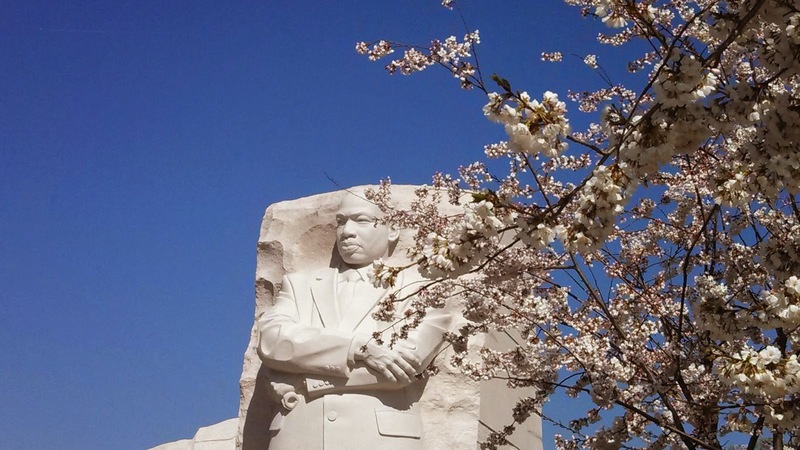 This time I veered to the right along Independence Avenue, so that I could see the Martin Luther King Jr. Memorial. 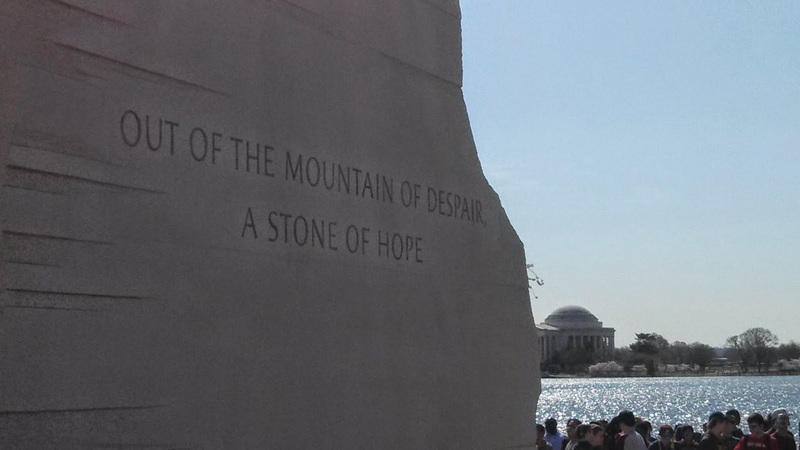 I had seen the memorial before, but I had not noticed how the civil rights hero’s words juxtaposed with the view of a memorial to a champion of freedom who also was a slaveholder. I then ran back along the Tidal Basin towards the Kutz Bridge. I stopped many times to take pictures or to avoid running into sightseers who were as lost in the beauty of the blossoms as I was. I soaked in the sun reflecting off the rippling water of the Tidal Basin. The wind rustled the branches and brought a peaceful feel to the surroundings despite the crowds. Unlike the humid days of July and August, the air was cool and dry and each breath reinvigorated my lungs. 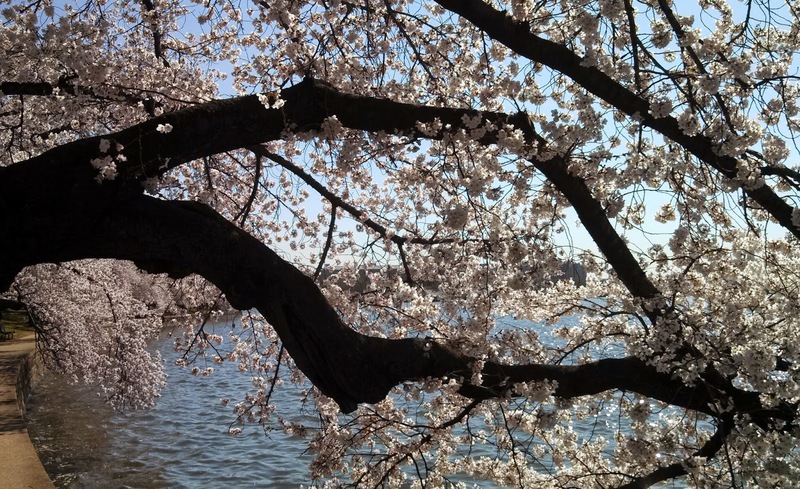 When I made it back to my car, I felt relaxed and satisfied with my first visit to the Tidal Basin cherry blossoms. I still know that the Saturday or Sunday crowds during cherry blossom season might be too much for me, but I will have to find time to visit on a weekday again. There's Just a Little Bit of Dust in My Eye.